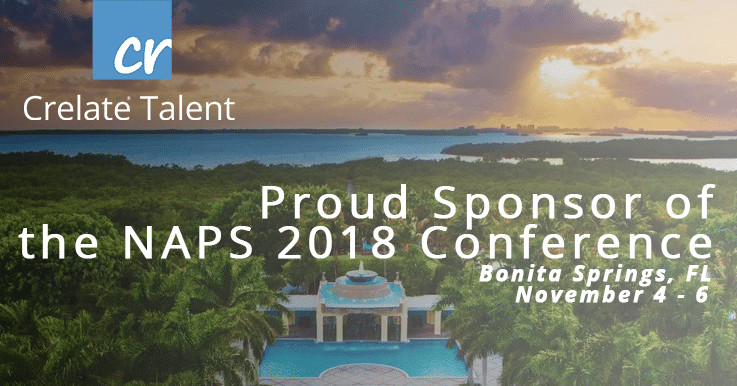 Attendees at the NAPS 2018 conference will learn how easy and powerful it is to align talent and demand pipelines in a unified recruiting solution and be able to help raise money for a good cause. KIRKLAND, WASH., Nov. 01, 2018 /PR Newswire/ — Crelate, the gold-standard for cloud-based recruiting software, announced today that it will demonstrate its industry-leading talent acquisition technology as a Silver Sponsor during the NAPS (National Association of Personnel Services) conference, November 4 – 6, 2018 in Bonita Springs, FL. Participants can indicate their selection by placing a business card in one of three jars that represent a non-profit organization working to improve professional talent in the community. At the end of the conference, Crelate will make a first, second and third place donation to each charity. The NAPS Annual conference is a 3-day event where attendees have the opportunity to learn strategies to improve their businesses and expand their professional networks. Crelate is a cloud-based recruiting software company that empowers recruiters to better manage talent and opportunity pipelines in a single solution. With fast and powerful capabilities, Crelate optimizes recruiting processes from sourcing to hiring. Since 2012, the Crelate team has focused on customer success and prioritizing innovation based on user feedback. Customers have called Crelate the “Best ATS on the market” and a “recruiting game-changer.” Join over 850 leading recruitment teams that improve their hiring efforts with Crelate. Visit www.crelate.com for more information.